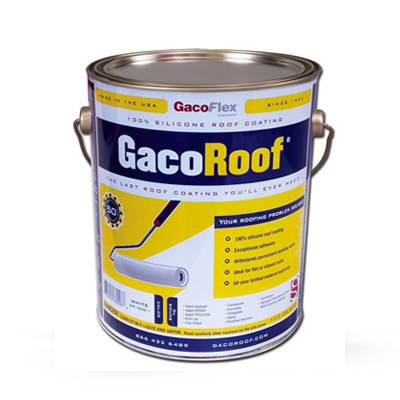 Gaco RoofTape seam sealing tape is pressure sensitive and is intended for sealing seams, fasteners and penetrations before GacoRoof Silicone roof coating is applied. Fleece backing is white, Adhesive is light tan. 2 inches wide, 50 feet per roll. Surfaces must be clean and dry. Cut tape to desired length and peel off release liner. Center tape over seam and firmly press into place, removing all buckles and bubbles. If applying over fasteners, press tape over all sides to conform tape to the shape of the fastener. If more than one piece of tape is going to be used, overlap any adjoining pieces of tape by a minimum of 1/2". 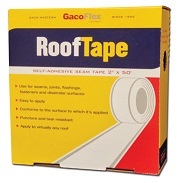 To prevent dirt pick-up, Gaco seam sealing tape must not be left exposed. 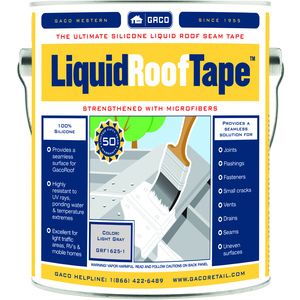 The tape should be coated with GacoRoof Silicone Coating as soon as it is applied.